In addition to helping you see the results of a number of one stage direct-to-implant (DTI) reconstructions, before and after images can also be a helpful conversation starter and communication tool during your consultation. Keep in mind that each patient is unique and that results will vary. Once again also please remember that Miss Jane O’Brien feels that out of respect for her patients, pre and post-op photos of her own patients are most appropriately shared in a private office consultation setting and not on the internet. She will be happy to review pre and post-operative photographs of her own patients with you, if relevant, in the privacy of her office when you meet with her. Preop (upper photos) BRCA1 gene carrier. Post op (lower photos) Bilateral NSM for treatment and prevention. She desired to stay about the same size and had implants placed in one-stage DTI using inframammary (IMF) incisions. 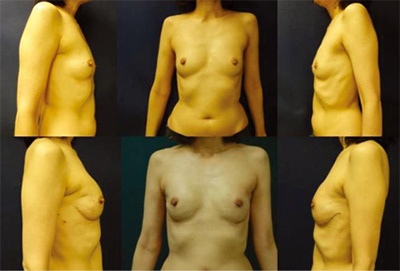 Preop (left photo) 42 year-old female-BRCA positive. Pre-existing incisions on both breasts. Preop (upper photos) 50-year-old woman-left breast ductal carcinoma in situ with a small area of invasive cancer /BRCA2 positive. Previous breast bilateral breast biopsies with lateral scars on each breast.